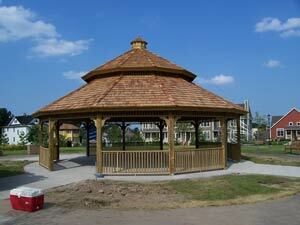 This 30′ x 30′ 12-sided Gazebo is our largest gazebo which can be done with a wood floor or a cement floor. The gazebo can come with or without screens to keep bugs out. As shown, this one has a double roof but you can also order in a single roof. Cedar shingles are standard. Made out of 40-year tested pressure treated twice kiln dried wood.